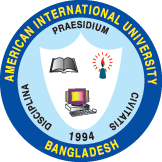 After one year of Certification, the SGS UKAS conducted a Surveillance Audit to the American International University-Bangladesh(AIUB). This is a regular mandate observed by SGS UKAS in its certification process to find out the improvements AIUB has implemented for the last one year. Further, to identify compliance of non-conformity and conformity of the different management operation system. After 2 days of surveillance audit, 26-27 October 2015, of the various units/departments of the university and the review of the Quality Manual which documents the processes and improvements described in the 8 clauses, the SGS UKAS surveillance Team, Mr. Shabab Ahmed Mahfuz and Ms. Farjana Ahmed , reported in the concluding rites of the visit that AIUB has no major non-conformity and therefore, its ISO 9001:2008 Certification with a Scope: Quality Management Operation System for the University is again granted with flying colors. In response, the Honorable Vice Chancellor, Dr. Carmen Z. Lamagna conveyed her heartfelt thanks to the SGS UKAS Team for the support they are extending to the university. She also underscored the efforts and commitment of the IQAC Team headed by Dr. Charles C. Villanueva, Pro Vice Chancellor for the preparations and coordination with the different offices of the university. She also expressed her appreciation to the Heads of the different units and departments for their active participation during the preparation and actual conduct of the audit. Present during the closing meeting were the Deans of the FASS and FE, Registrar, Additional and Deputy Registrars, Directors, Deputy and Asst. Directors, Senior officers and the IQAC Team members. The meeting ended with assurances expressed by the Vice Chancellor that the best practices will be sustained and improve further the areas or systems and procedures of the management operations of the university.